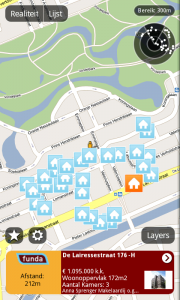 … changes the map view into a list view. 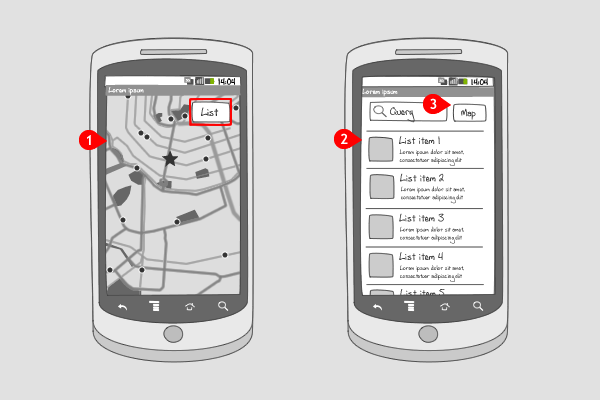 By tapping the button in the upper right corner again, the user can return to the map view. A set of data can be viewed in all kinds of ways, e.g. in a list, on a grid, or on a map. The user might want to toggle between views to see the data in an other layout. 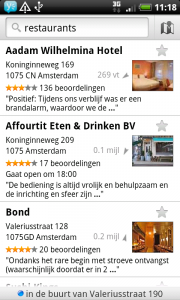 Most commonly from list view to map view, and from list view to icon view. The button can contain text, an icon, both icon and text, or it can look like a switch between two icons. The button doesn't have to be placed in the same spot on each view, but this might confuse the user. It is recommended to always provide the user with the option to switch back and forth. When you always want to have the option to change the view available for the user, you should apply a dedicated button. When your screen space doesn't allow a dedicated button, you could consider a change view option in a tab bar or the options menu. The button is always visible, even when it is not needed. 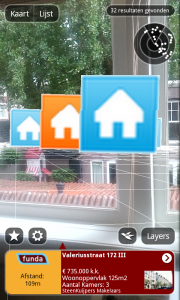 1 The Funda layer in Layar, shows a double button on top of the screen. 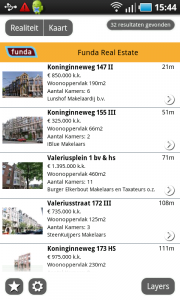 In this list view, the user has the possibility to switch to map view, or reality view. 2 In the map view, the double button is still located in the same spot. The options to switch to are now reality and list view. 3 Finally, in the reality view, the options to switch to are map and list view. 2 ... to switch to the corresponding view. Notice that the button to switch back is here placed in the bottom left corner of the screen. 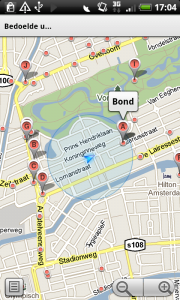 This is common in all google maps applications, so expert users will know how it works. New users might find it hard though to notice, that the map icon in the former view can be tapped to switch views. 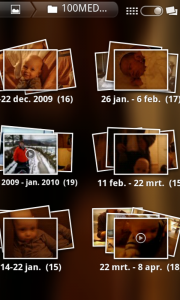 2 ... in the stack view, where all stacks of images and video's are provided with dates. Other ways to change view on a set of data?